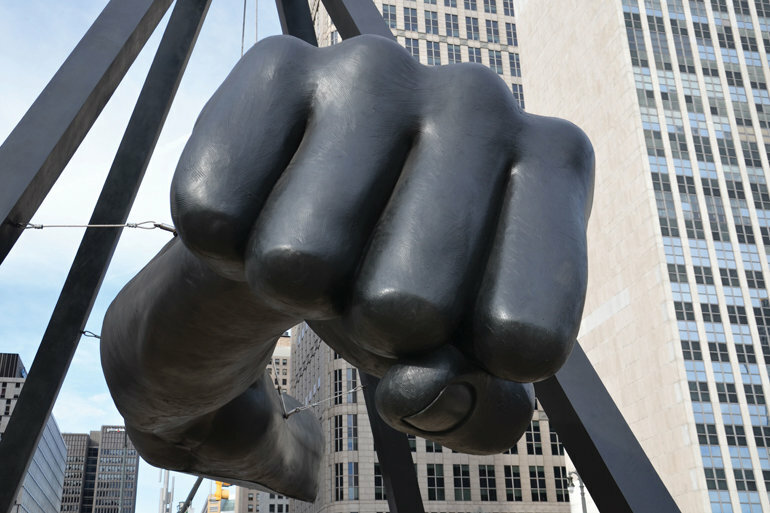 Sculpture of Joe Louis’ arm in Detroit. Image via katebackdrop. Pragmatism, which we like to identify as a quintessentially American trait, indeed is often a good thing. But as with many other good things, it comes with a dark side. In what Gibson, who heads the Exploration Group, calls the “maker” cities and states of the Midwest and Northeast, people historically worked primarily with their hands. They were factory workers, carpenters, plumbers, engineers. They could interact with the physical world to make it do what they wanted. But there’s more to it than that. We all see problems though the lens of our own occupational backgrounds and skill sets. I often see the world as a consultant would, for example. Rust Belt places, steeped in a culture of working with their hands, view the world in that pragmatic way. The manual worker or tinkering engineer says, “What can I do with the things that are in my hands?” They are often quite ingenious and creative in making use of these, but they tend to think only in those practical terms. The key question is, “Does it work?” From there it is, “Does it work efficiently?” These are the values of industrial management articulated by Frederick Taylor a century ago. By contrast, the coasts and creative centers have very different ways of seeing and interacting with the world. Creative people from the Rust Belt who move to Silicon Valley or Austin or New York often describe a sense of relief or even exhilaration. This isn’t because of the physical environment, but because of a culture that sees and values possibilities rather than only practicalities. We see this in the mantra of Steve Jobs, who thought that products needed to be “insanely great” and who built a company whose advertising slogan was “Think Different.” In Silicon Valley, people dream the impossible dream, one that is decidedly impractical, then sail off into the unknown to try to make it happen. This is very risky. It often flops badly. But the successes are what create the world we live in. On the other coast, it wasn’t a pragmatic decision for Donald Trump to ride down that escalator and announce that he was running for president. He already had a great business. He had a lot to lose by getting involved with politics. As commentators routinely asserted, he didn’t have “a path to victory.” And yet he won anyway. Trump is a lifelong New Yorker. His willingness to sail off on a difficult, audaciously ambitious journey without knowing if he could make it to the other side is a powerful, tangible example to the world of why New York has remained America’s and the world’s premier city for so long, even decades after its physical advantages, such as its port, have declined in value. Sailing off into the dangerous unknown is what the explorers of old did. Gibson named his firm the Exploration Group to make the point that it is still possible for organizations and places to get to destinations when they aren’t sure how to get there or what they’ll find when they do. This is ultimately what the people in creative capitals do. They explore unknown territories without a map, even if they don’t think about it that way. Rust Belt regions shouldn’t try to jettison their history and culture. That’s neither realistic nor desirable. Pragmatism itself is a powerful and necessary tool. It just can’t be the only one in the tool chest. If these communities want to bend the growth curve, they need to expand their repertoire of capabilities to include what appears to be the impractical and the decidedly non-pragmatic. That would do much more for their entrepreneurial ecosystems than any amount of gigabit fiber or venture capital funding ever will. This column originally appeared in the May 2017 issue of Governing. This seems to be describing a failure of visualization. We’re going through a revolution on that point, one that doesn’t seem to have altered the Mid-West tendency you describe. A virtual reality world that instantiates the ephemeral into a world you can see and manipulate with your hands would seem to be a bigger deal for those tactile oriented people in the maker cities. That’s a great opportunity, to bring half of the country back into the game so it’s firing on all cylinders. I wonder who will bring that application to the world, a creative or a maker? I’d suggest that it would be someone with a foot in each, possibly an engineer responding to a direct need of some sort. Just in computers: Jobs and Wozniak were garage tinkers. As were Hewlett and Packard, and before them Eckert and Mauchly (even though they tinkered in a university lab). The paradox, of course, is that most technological change is evolutionary when it happens…a better faster way of doing something. Then when the inventors figure out what else can be done with their development, it becomes revolutionary. A PC by itself was not so groundbreaking. It was just a small computer, and computers were already a 30-year-old technology. But when it got a graphical user interface, and word processing, and spreadsheets, its utility became vastly greater. (Take it from someone who used to type reports and do spreadsheets on 13-column paper.) Then again when it got connected with every other PC in the world by internet protocol. The short version of my objection to this piece: “fracking represents a bigger economic form of progress for our society as a whole than the innovation in Silicon Valley”, to paraphrase Peter Thiel. The slightly longer version: more or less everything you characterize as progress coming from coasts or creative centers is (I claim) non-productive squabbling over rents. Often quite artfully disguised, to be sure, but how much of the Internet is paid for by ad revenue? Or is paid for by venture capital, but is expected to one day be paid for by ad revenue or by monopolistic profits? To take a step away from tech for a minute, Lyman Stone likes to talk about declining towns reinventing themselves by bringing in universities. We don’t produce coal, we produce education. I claim that this, too, is mostly unproductive rent-seeking; that most education is omnidirectional signaling and does not actually add value. “Creative” thinking is all very well while the student loans are flowing, but Pikeville is going to be in a hell of a pickle when the tap shuts off. Now, it may be rational for a town to bring in a university or try to reinvent itself as a tech hub in order for its residents to capture more rents. But our theories should account for the fact that that’s what’s going on, and that expecting widespread growth from widespread rent-seeking reduces to the old gag about taking in one another’s washing. Similarly, it may be that there is increasingly little genuinely productive work to do, and that rent-seeking is all that’s left. Well, fine (I mean, terrible, but whaddayagonnado), but again we shouldn’t expect the benefits from rent-seeking that we would expect from genuine productive activity. I first encountered Dwight Gibson in the video series “For the Life of the World” — interesting stuff! For each year that the investment money was received by the companies in question, I summed them all for the entire nation (other experiments involved industry clusters, but this comment will be long enough already). I then made a spreadsheet alongside annual budget appropriations to the National Institutes of Health. I wanted to assess the contribution of the visionary opportunity finding mentioned by Martin yesterday. Looking at the 75-year period from 1942 to 2016 inclusive, the first year that total private venture investment in these eight industries rose above $1 billion annually was 1996. At that point the NIH alone represented a prior public investment of just over $149.5 billion. It first represented more than $1 billion annually during the LBJ administration and had steadily accelerated onward past $10 billion a year by the Clinton administration. As of this new year, the running total of private investment stands at around $120 billion, a tidy sum until you realize that that’s next to just the NIH running total of $670 billion. I suspect rent-seeking is not an uncharitable way of describing the actual relationship between risk and reward, possibilities and practicalities being managed in that field. I won’t speculate on whether it’s representative of other high-tech fields, although venture capitalist Bill Janeway says digital microelectronics and networks were another area much the same. Fascinating and non-technical explanation of what has been going on, Neil. Thanks! Can’t agree with this analysis. I’m from an industrial city, Two Rivers, Wisconsin, in and industrial County – Manitowoc, where the major city, Manitowoc, is also industrial. As a student of American industry for the purpose of regional economic development, the major problems as I see them, have been managerial, the MBA syndrome. Yes the working people do have spatial skills, enabling them to shape anything with their hands. The skill is the mind-eye-hand coordination. When given a challenge, they will solve it. The automobile industry, hired lawyers to fight pollution, economy and safety requirements that the public wanted. The reliability needed when people began driving 30,000 miles a year, instead of 10, could have been built in with Deming Total Quality Management, but that was counter to the planned obsolescence. The Japanese did a better job of making cars for Americans than the American companies. This failure can not be blamed on the workers, but that is exactly what management is trained to do. Mirro Aluminum was acquired by The Newall Companies conglomerate in 1983. According who friends who worked there, it was bled by the corporate spreadsheet masters, extracting the wealth built up since the 1890s. The current Metropolitan Obsession of analysts, marketeers and policy makers does present challenges. The suburbanization policies post WW-II that flattened and sprawled housing development, left those in the cities, infrastructure rich and money poor. These policies have given us the coastal traffic jams beginning in the 1970s when it was learned than a high speed, limited access Interstate Highway System can not maintain high speeds in a local, multi-jurisdictional region. I agree strongly with psmith (and regionswork). Do we really need refrigerators linked to the Internet? I would go even further: the cleverness of East Coast “financial engineers” is not only rent seeking, gambling, or outright fraud, but the pursuit of financial rent and work-free lucre actively helped destroy the traditional Midwestern economy and, ultimately, the American economy, as vampire squids like Bain Capital and their ilk stripped and destroyed companies and communities. c.f. Lancaster, Ohio. The people who destroyed Anchor Hocking were mighty clever and mighty creative, but of what benefit were their efforts except to a few members of the parasite class? Without east coast capital markets, Midwestern industrialization would not have been possible in the first place. The post-Civil War emergence of capital markets in NYC made the mobilization of capital on the industrial scale in the Midwest, and elsewhere, possible. Every coin has two sides. The Midwest’s decline was a result of it’s failure to compete with the South, Mexico, and Asia for industrial investment. If Midwesterners had figured that out, they would have found willing investors who cared not whether their investment returns came from operations in Indiana or China. Sure. But the argument is that capital markets and “financial engineering” have become ends in themselves, ways for extracting wealth from the economy. Parasites, in other words. Our financial engineering/casino gambling sector has become too dominant, too extractive, and so convoluted in abstraction that an epic crash is coming. The bubbles can be inflated for only so long. The same “financial engineering” that some claim to be at the heart of Midwestern decline has benefitted industrial economies in the South, Mexico, and Asia. That’s not a bubble, that’s a change in economic patterns. Midwesterners will simply have to accept these changes and respond to them. While I don’t disagree at all with your last sentence, financialization and engineering are more problematical than you suggest. It’s interesting to note that most of the comments so far highlight Aaron’s point. They instinctively are defensive and reactionary. How about taking him up on his challenge of looking forward to see how we in the Rust Belt can utilize our strengths and talents to find opportunities in the future rather than nitpick why his perspective has to be wrong? It’s not “nitpicking”. And it is not even a new critique-it’s old school Marxist if anything (on my part at least). The dominance of the American economy by clever rent-seeking Finance in all its permutations is a fundamental flaw in late stage American capitalism. I live in Cali, by the way, where the media is full of the excitement of running an entire economy on the ephemera of “Aps” that make the lives of the top ten percent a little more convenient and consolidation of the economy more practical. Same, actually! I don’t know about old-school Marxism–I just like fast cars and open spaces and worry that my children or grandchildren won’t have much of either, and I’m quite happy to embrace the label of reactionary–but my criticisms are informed by my time in the very heart of Silicon Valley, as well as in academia. Don’t worry. The U.S. is vast and you can live in large swathes of it for virtually nothing. They’ll have all the space and movement they can handle no matter what happens in the Midwest or elsewhere in America.